OMG! 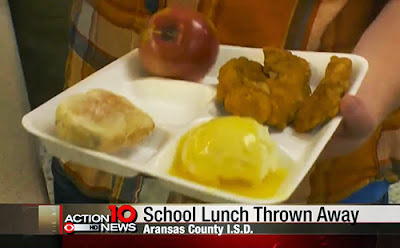 Some Schools Are Throwing Away Lunches If the Children Have No Money to Pay! It's unbelievable and shocking, but in schools across the country, food is actually being thrown away if children have no money to pay for it. The big questions are how can this happen, and WHY is it happening? Children at school go through the lunch line and pay at the end. If the cashier discovers that there is no money in the child's account, in many cases the lunch is being tossed as garbage. Since the child has already touched the food, the food is thrown away for safety reasons. Although some children are given a piece of fruit, that is not nearly enough to fill their growing tummies. At the same time, food is being wasted. Children are going hungry. This is not an incident that occurred in some third world country. This is happening right here in the USA. One blatant example hit the news recently in the state of Utah. As many as 30 to 40 students at Uintah Elementary School in the Salt Lake City School District had their trays taken away because they couldn't pay for their lunch. It's happening in other states, too, such as Texas and Massachusetts. It raises a huge moral concern over school representatives that act so reprehensibly as to take food away from a child. One fifth-grader at the school had her lunch taken away and thrown out by a district nutrition manager who was monitoring students' school lunch accounts. After the incident, two Utah senators got involved by visiting the school to investigate the behavior and recommend better solutions to the problem of unpaid lunches. One of the senators, Todd Weiler, R-Woods Cross, stated that whoever is found to be responsible for the incident through due process should be fired, because that person "used (their) power to humiliate and embarrass children." The normal procedure is to notify parents when a child's lunch account is at zero. There is also supposed to be a grace period. But what about children whose parents simply do not have the money? The problem is not solved by humiliating the child. Could this be happening at your child's school? NO CHILD SHOULD EVER GO HUNGRY! !